This sticky-sweet treat — my grandmother's version of the classic dessert known as the pavlova — may make you want to lick your bowl. 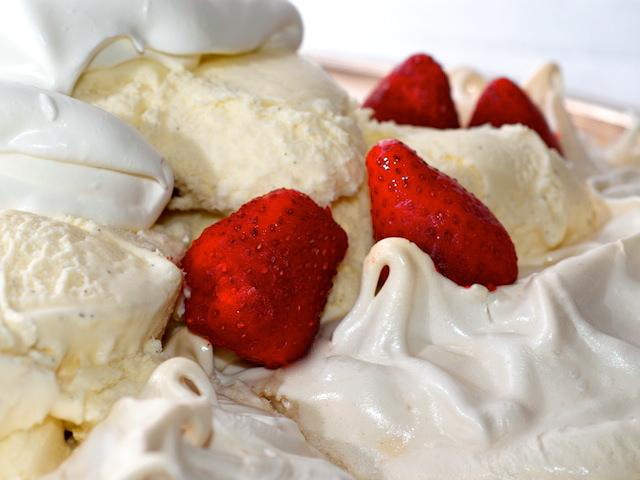 In my family, we weren’t allowed to lick our bowls at the table, but no one blinked if we took them into the kitchen to get at those final drops of strawberry, ice cream, and meringue. In a mixing bowl, beat the egg whites with the cream of tartar on low speed until the mixture starts to foam up. Add the sugar slowly and keep blending. When the eggs are getting glossy and starting to stand up in sticky peaks, add the vanilla. On a baking sheet greased with butter or covered with a sheet of parchment paper, plop half of the meringue mixture and spread it into a circle. Use the other half of the mixture to construct walls around the edges of the circle, sculpting them as thick and as tall as you can make them. Bake for about an hour (or longer); you aren’t really baking it so much as drying it out. When the meringue is just firm and lightly browned on the edges, remove it from the oven and let it cool. At serving time, fill the meringue bowl with vanilla ice cream and top with whipped cream. Sprinkle the toasted almond slivers on top, and serve with a bowl of fruit on the side. For a less-sweet meringue, reduce the sugar to 1 cup. High humidity can prevent the egg whites from thickening into stiff peaks; if this happens, you won’t be able to sculpt them into a bowl shape. Instead, simply bake the egg whites (they'll form a rounded shape on the baking tray) into a meringue and pile the various garnishes on top when done. The easiest way to get the ice cream into the pie shell evenly is to slice straight through the container of ice cream with a serrated knife, cutting wedges of equal and even thickness. Peel away the cardboard wrapping and lay the slices of ice cream in the pie. Read more about Marisa McClellan's family traditions.